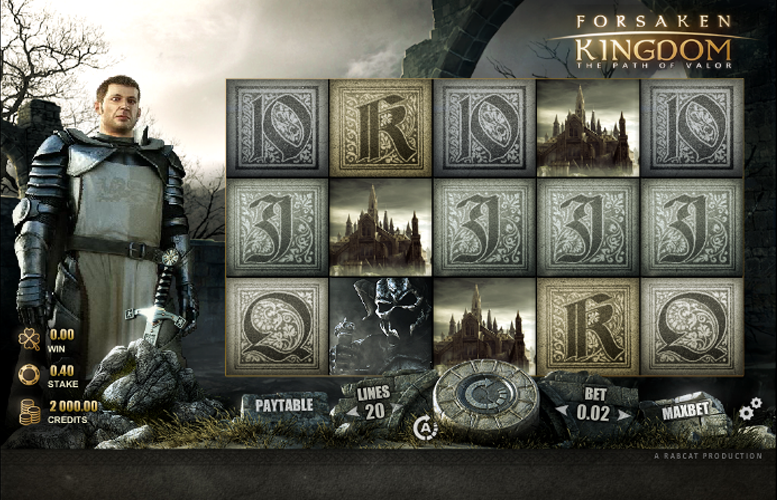 Take a trip back to the time of King Arthur on the Forsaken Kingdom slot machine from Microgaming. This one really is a treat for the eyes too. The animation and artwork throughout is simply stunning. It gives the impression that you’re really about to go into battle against the black knight himself! 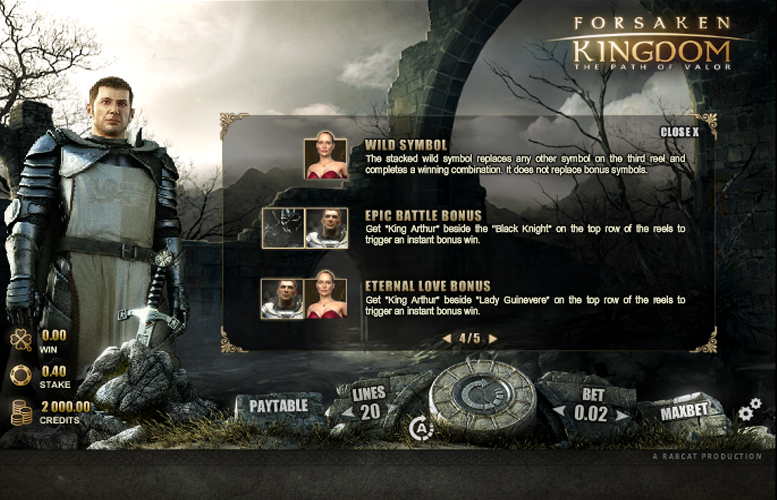 There are also some awesome special features on the Forsaken Kingdom slot machine. Let’s therefore not waste any more time and get right down to looking at the specifics of this terrific game! Fantastic artwork and animation. This slot really feels like a lot of care and attention to detail has gone into creating it. Innovative game features. There are multiple different features that we’ve never seen on a slot before. This is always a nice touch. Massive top prize. The chance to win 20,000x the line bet is always nice. The best part is, it’s not even a progressive jackpot either! Rather low main game prizes. Honestly, we were struggling to find flaws with this title, so we had to be ultra-critical. Most players won’t mind being limited to £40 a spin anyway. Excalibur = 20,000x the line bet. Arthur = 1,000x the line bet. Black Knight = 500x the line bet. Camelot = 250x the line bet. If players land at least two shield symbols, they will be award a Knight of the Round Table. These will be displayed around the spin button. Get all 12 Knights and the bonus round will be triggered. The collected knights are displayed around the “Spin” button. The value of each single knight depends on the played number of win lines and chosen bet size. 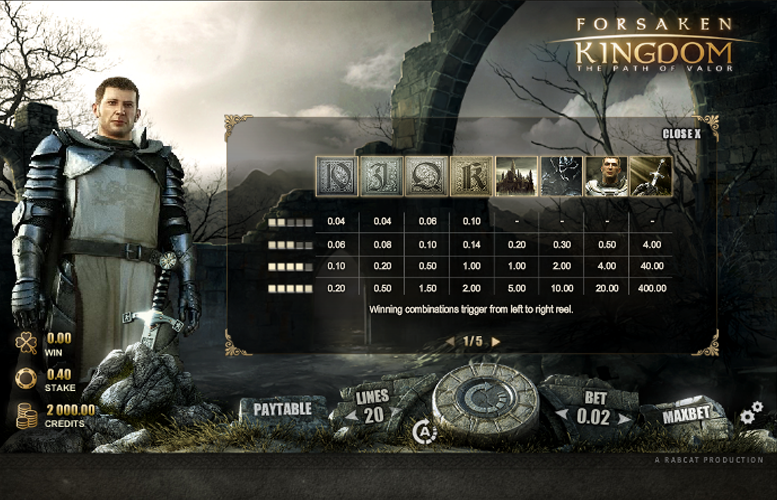 Once the bonus feature is triggered, the arithmetic average of all received knights (called “bonus bet”) will be multiplied by the won “table multiplier”. If players use the “max bet” option, they will receive the maximum from this feature. The Guinevere symbol is the game’s “wild” icon. She will only appear on the third reel but can substitute for all symbols except the “bonus” symbols. 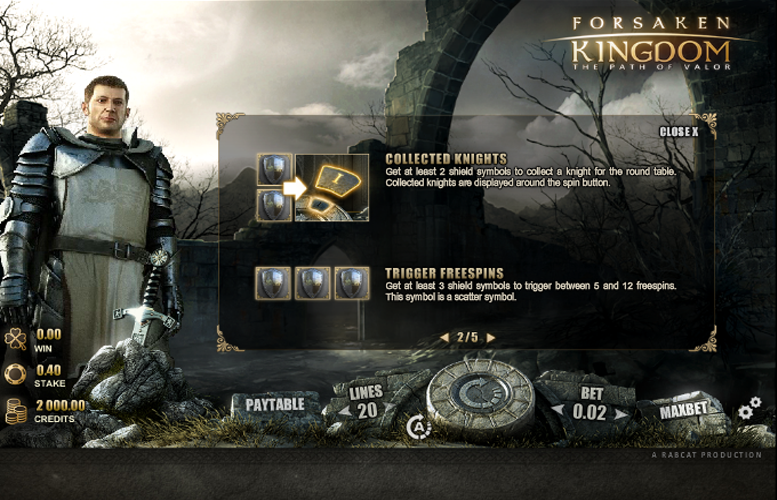 Landing a King Arthur symbol next to the Black Knight on the top row of the reels will trigger and instant bonus win. Landing a King Arthur symbol next to Lady Guinevere on the top row of the reels will trigger an instant bonus win. Landing at least three “scatter” shield spins anywhere on the reels will trigger between five and 12 free spins. Queen = 75x the line bet. Jack = 25x the line bet. Ten = 10x the line bet. 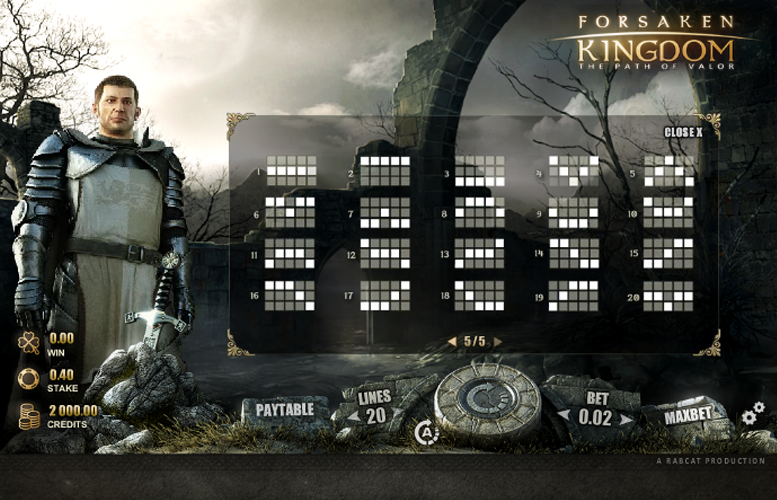 Players can adjust the number of win lines they play on the Forsaken Kingdom slot machine, as well as the amount they decide to bet on each one. They can opt for any number between one and 20 for the win lines. Meanwhile, they can select between 1p and £2 for the wagering amount on each line. This means with all values set to the minimum, the lowest possible bet per spin on Forsaken K Kingdom is just 1p. Conversely, with everything maxed out, the highest possible bet per spin is £40. This is hardly going to excite the highest rollers around, but most players should find it ample. All told the Forsaken Kingdom slot machine is a fantastic title. We particularly enjoyed the dark and atmospheric artwork, as well as the abundant special features the title has to offer. Oh, and there is the chance to win 20,000x the line bet as well! How’s that for a jackpot! The only real caveat we could find was that the title doesn’t let players bet very much. Granted, £40 is plenty for most gamers but there are certainly some around who want to seriously splash the cash. Still, everything considered Forsaken Kingdom is a winner for us. This game has a rating of 5 / 5 with 772 total reviews by the users.